Our Day Spa Staff are are able to combine the knowledge and experience of both the medical and cosmetic industries to help you look and feel your absolute best while utilizing advanced technologies, higher level services and results-driven skin care products only available through our office. Licensed Esthetician Ali is a licensed esthetician who graduated from Midwest College of Cosmetology in 2009. She has developed a passion for skin care and a love for preventative services, helping her clients maintain beautiful skin before problems arise. Ali's beauty advice is to take care of the body internally, and always use and apply SPF. Her hobbies include reading, writing, drawing and spending time with her husband and their dog. Licensed EstheticianChristine is a graduate from La James International College with over thirteen years of esthetics experience. She loves helping clients with their skincare concerns, especially sensitive and acne prone clients. Her favorite spa service is the Medi-Infusion Signature Facial as it combines top of the line ingredients and facial devices. "I had one the week before my wedding and was still glowing!" Her best advice is to take the time to wash your face at night and wear sunscreen daily. She loves to spend time with her family and two Labradors! Licensed Esthetician Gabby comes to Skin Dimensions as a graduate of Tricoci University of Beauty Culture. She chose esthetics because she loves the atmosphere! Gabby’s favorite part of her job is enjoying the company of her clients and her most important skin care advice is to be consistent with a skin care regimen. Her favorite service is the glycolic peel paired with a relaxing facial like the Guinot Aromatic Faciale or Soothing Seaweed Facial. In her free time you can find Gabby spending time her family, cooking or binge-watching a Netflix show. 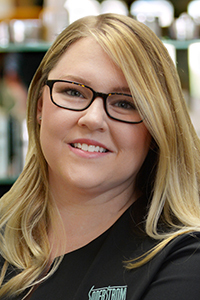 Licensed Esthetician A graduate of Midwest College of Cosmetology who has worked as an esthetician for over ten years, Jessica brings a passion for skin care. She finds her work creative and rewarding and loves working with clients to individualize their skin care regimens as well as develop new makeup looks. When she’s not counting down the days till Christmas, Jessica is usually spending time with her family and her dogs. Licensed Esthetician Jodie is a graduate of Tricoci University of Beauty Culture and is an esthetician who draws inspiration from making her clients happy. The most important skin care advice that Jodie has is get a great eye cream and moisturizer to preserve the thin skin around the eye. When she’s not at work Jodie likes to spend time with her two sons, read about new beauty trends and shop. 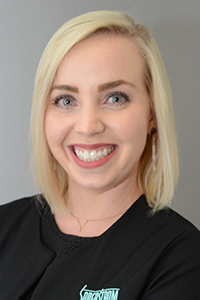 Licensed EstheticianKalea graduated from the University of Aesthetics in Downers Grove in 2015. Her favorite part of her job is getting to educate clients, and customize their skincare routine to fit their needs. Kalea really loves the Med-Infusion facial because you can customize this treatment based on your particular needs. In her free time, she likes to workout and practice yoga, spend time with family and friends, and play with her Pomsky (dog) Harrison. Licensed Esthetician Kelli graduated from Tricoci University of Beauty Culture in 2010 and is a spa coordinator and esthetician. She is passionate about helping each guest reach their skin care goals and learning the science behind the skin and skin care products. Whether she is seeing a guest for a special event or helping them maintain healthy skin for years to come, she truly loves helping them feel pampered and educated. In her free time, Kelli enjoys writing and spending time with her beautiful family. Licensed Esthetician, Makeup Specialist & Certified Lash Extensions Artist Laura is a graduate of Midwest College of Cosmetology with over 17 years of experience as a licensed esthetician and 27 years of experience in the cosmetic industry. Laura is enthusiastic about educating clients to help them sustain quality skin care practices at home, in between visits. She tells her clients that "the best foundation you can wear is glowing, healthy skin. In her free time, Laura enjoys spending time with her husband, 2 daughters, 1 son and 2 dogs. Licensed Cosmetologist & Licensed Esthetician Linsey is a graduate of Capri College’s cosmetology and esthetics programs. She comes to Skin Dimensions with an enthusiasm for educating clients about skin care. Her favorite spa service is the 24 Karat Gold Facial because it combines massage and glycolic for a luxurious experience. Linsey’s advice she gives to clients, “If you don’t do anything to your skin, at least wear your sunscreen!” In her spare time she loves being with her family, outdoor activities, and doing hair. Licensed Esthetician Misty is a graduate of Midwest College of Cosmetology with ten years of industry experience. As an esthetician, she enjoys connecting with her clients by helping to improve the way they look and feel. Misty’s most important skin care advice is to hydrate after cleansing, and always love sunscreen more than the sun. In her free time, you can find Misty soaking up moments with her husband and two little boys. Licensed Esthetician Rachel completed her training for her Esthetician License at the Paul Mitchell School of Normal in 2010. Her background in the beauty industry includes makeup, product sales and performing skin treatments on clients. She loves to help her clients feel great about their skin by recommending the best skin treatments and skin regimen for their skin type. Her best skincare advice is to use Glycolic in the morning and Retinol at night to keep your skin looking radiant. Her hobbies include spending time with family and friends, and in the summer months relaxing and boating at the Lake of the Ozarks, MO. Licensed Esthetician Sarah comes to Skin Dimensions as a graduate of Midwest College of Cosmetology with over 5 years of experience. Sarah chose to work in skin care after struggling herself with problematic skin. Once she found a solution, she fell in love with helping others and raising their self esteem. Her most important skin care advice is to protect yourself from the harmful rays of the sun, and to not neglect taking care of your neck! In her free time, Sarah loves to stay active by running or swimming. She loves spending time with her family, soon-to-be husband and her dog. Her all-time favorite place to visit is California. Licensed Cosmetologist Chelsea began her career as a cosmetologist in 2009. She strives to bring out the best in clients, and enhance their natural beauty by providing them with the highest quality of service possible. Chelsea advises that everyone wear sunscreen and her hobbies include cooking, working out, reading and spending time with her two kids. Licensed Cosmetologist, Licensed Massage Therapist Liz joined us as a graduate of ICC and Regency Beauty Institute with over four years of experience. A self proclaimed hands on learner, she thoroughly enjoys working in a spa environment. Her most important skin care advice; stay hydrated and use a great moisturizer. In her free time she enjoys reading a good book and staying fit. Michelle is a licensed cosmetologist with 22 years of experience with a tenure of 13 years at Skin Dimensions Day Spa. Her favorite part of her job is meeting clients, educating them and helping them feel great about their skin. Her most important advice? Sunscreen, sunscreen, sunscreen (it helps to stop premature aging such as fine lines & wrinkles). During her free time, Michelle loves spending time with her family, boating and fishing at Oak Run. She also enjoys visiting her eldest daughter at college and watching her youngest daughter play sports. Licensed Cosmetologist Monica is a cosmetologist with six years of experience working in the beauty industry. Monica loves to meet people and create new fresh looks for her clients. Her favorite part of the day is pampering her clients and getting to know them. Her most important skin care advice is to stay out of the sun to prevent skin cancer and premature aging. In her spare time she enjoys cooking, and spending with family and friends. Licensed Cosmetologist, Makeup Artist Nicole is a graduate of cosmetology school who possesses over 17 years of experience in the beauty industry. As a veteran makeup artist, Nicole’s goal is to make every client who comes through the door feel more beautiful than ever before. Her beauty advice; always wash off your makeup at night and moisturize, moisturize, moisturize. Nicole’s hobbies include reading, cooking and running. Licensed Cosmetologist Pat is an cosmetologist with over 38 years of experience working in the profession. With a desire to make individuals feel beautiful, Pat uses her creativity and extensive knowledge to revitalize her clients’ looks. Her most important skin care advice is to always clean then tone, apply moisturizer and use sunscreen. In her free time, Pat enjoys exercising and shopping. Licensed Cosmetologist Skylar is a graduate of Regency Beauty Institute with 2 years of cosmetology experience and 3 years of cosmetic experience. She enjoys making her clients feel beautiful and helping them find the best products for their skin care needs. She is passionate about seeing her clients faces light up with joy and happiness while also helping them feel relaxed throughout appointments. In her free time, Skylar enjoys quality time with her husband and daughter, spending time outdoors with her family and working on her house. Licensed Cosmetologist Sydni is a graduate of Oehrlein school of cosmetology and works as a nail technician, makeup artist and spa coordinator. Sydni has a passion for making people feel beautiful and loves the spa environment. She loves building new relationship with clients and educating them on the health of their nails. In her free time she enjoys working out and spending time with her friends and family. Licensed Cosmetologist Teresa comes to Skin Dimensions as a graduate of Gateway Tech. With an impressive 20 years of experience working in the industry she has spent the last 11 years at Soderstrom further honing her craft. Teresa’s favorite part of the job is seeing her clients get excited about their results. Teresa’s beauty advice; stop tanning and use SPF! When she isn’t helping her clients achieve that perfect glow, she can be found reading or working out. Licensed Nail Technician Mischell is a graduate of Central Illinois School of Nail Technology and has over 12 years of experience. She prides herself on being very detail oriented and she LOVES Shellac Nails. Mischell enjoys conversing with her clients and educating them about the health of their nails and her most important skin care advice is to always moisturize in order to keep skin healthy and hydrated. In her free time she loves snorkeling in the Caribbean.